81-945 Inspirations Mini Calendar. Minimum Order Quantity: 100. 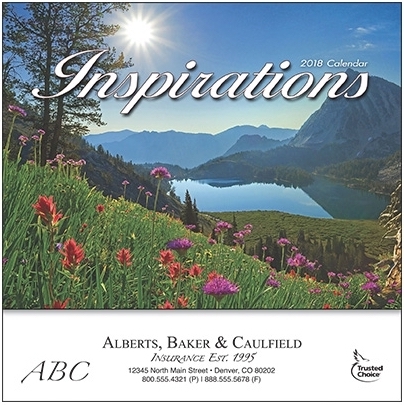 This beautiful mini calendar will provide a peaceful respite from your busy schedule all year long. 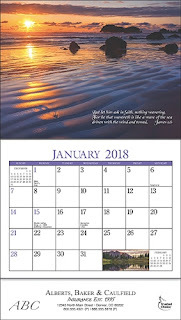 Each monthly photo comes with an inspirational bible verse. 13-Month Format. 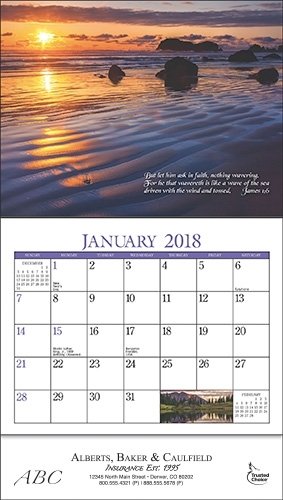 Size Open: 6 1/2" w x 11 5/8" h. Size Folded: 6 1/2" w x 6 5/8" h. Imprint Area: 6" w x 1 3/16" h. Imprint: Black/Greyscale. Black Ink Only.